*some assembly required: 20 years! Who knew?? The economy is a mess and architects are jumping off of empty buildings. Are we talking about June of 2009? Nope - June, 1989!! We started this rag-tag little operation in the depths of the big bust of the late 80's, and we learned a little something about how to survive from that experience. Very little has changed in 20 years. We're still a Mom and Pop operation, still focused on the same core values of bringing our clients "more bang for the buck". 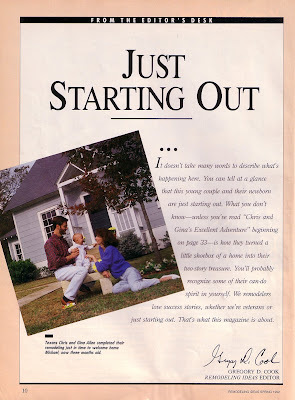 Sure, we have a bit more gray hair than in the magazine shot to the right, and the little guy in the photo is 6'-3" tall, but we're still digging what we're doing, and that's more than we could have hoped for in 1989. Thanks for joining us for the ride!